As a follow on to your advice of sleeping children on holidays, what is your suggestions on when I should book my airfare - during my 12-month-old's regular nap time or when she is usually awake. I fear if I travel when she usually sleeps whe won't be able to due to the going-ons but I fear if we're in a plane when she is usually awake she will not want to sit still and want to crawl all over the plane. I'm kind of dreading the three hour flight, but must book it soon. Yes recently in an article of holiday travel I mentioned to choose your time for flying carefully. Best time to avoid flights which are unfortunately the cheapest are the early morning flight ie. 6am or late at night flights ie. 7pm or later. Believe me, the drama that this will bring will stay with you are longer than the pleasure of the cheaper flight! The 6am will require you at be at the airport at 5am, which add in leaving home time you’re likely to be at 4.30am, even if your little one sleeps and travels in the same clothes – this might be fine for one day but for every other day of your holiday your child will wake at the same time ie. 4.30am, yes they will! So avoid this early flight. As tempting as it is to go during their usual sleep time – hmmm what if they don’t sleep? You are then in the situation of trying to calm and settle an overtired child on a flight where there is no escape – and overtired children are apt to tears about anything and everything including the colour of their custard. So this is best to be avoided too. My recommendation is to definitely go on a morning flight, let your child sleep as normal and wake at the normal time. 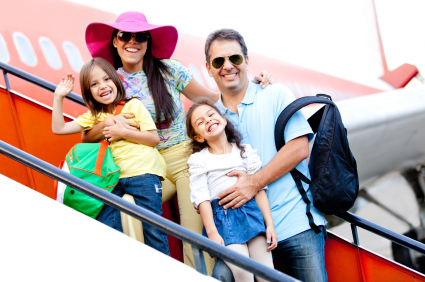 Book your flight for as soon as practical after this including travel time and waiting at the airport time. So a 7am wake up, try to be at the airport in the next hour or so, your flight is likely to be 8.30am onwards. This will give you a 3 hour window of opportunity before the tiredness associated with a day sleep start – hopefully nicely timed for the end of your journey. Your child is at their best after a good nights sleep and you also avoid waking at some horrid hour every day while away. The morning will be the best time for your child, an afternoon flight just means that they are that more tired than the morning. So go with their best time of day to give them the best opportunity to be successful. Remember to take your own snacks and drinks, so that when they are hungry you have something on hand. Do not rely on the airline, their food is just a bonus. Go for little bits like a packet of sultanas that take ages to eat (also great for coffee shops). And be sure to have that little backpack with bits n pieces to play with for entertainment. Also try for a window seat the aisle seat is too tempting! While waiting in the airport for the hour before, DO NOT SIT DOWN, this is the time to walk, run, explore the airport, remember my balloon suggestion. Save your eating for the flight as well. All of this will work - provided your flight is on time! !